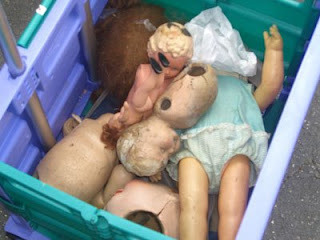 Sunday when I was shopping with friends at the Long Beach Flea Market I was walking by a booth when I spied two big crates of old doll parts. Jane and I screamed in glee (glee? :). 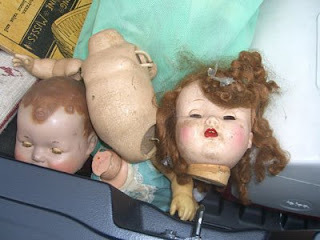 Our friend Bonnie a little skeptical as we dug into the dirt and sawdust to pull out doll legs and bodies and heads. Here's a few in the trunk of my car for the trip home. 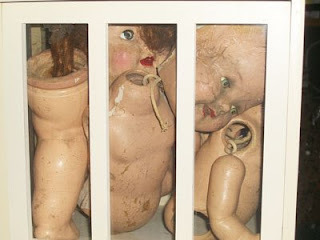 When I got home I decided to store my little dolly parts in this terraium for safe keeping....don't they look cute? 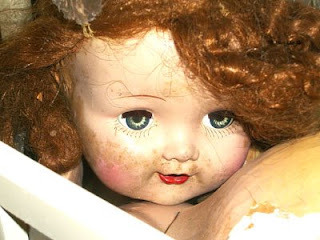 I can just imagine how cute this little baby doll was when she was brought home and placed in a little girl's loving arms. Did she scream with Glee? (glee? 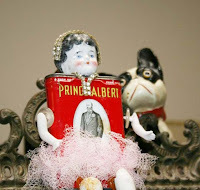 :) Did she have tea parties and long talks with her owner? Today even without a body she seems happy to me. I can't wait to use her in an art piece so she will bring new memories to others. Hey, look Ma I have a new body! Ha ha I had a new wire dress form sitting in the garage and thought I'd try a doll's head on the mannequin....too cute. It's so true, one person's trash is another person's treasure. I love, love these dollie parts and can't wait to use them. If you have any ideas of what I can do with them, please leave me a comment. Have a great day! It's Sunday evening and it's been a long and fun day. 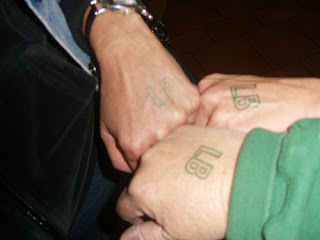 Can you guess what LB is stamped on our hands? Lovely Blonds, Little Bites, One Pound, Lovely Beautiful. Nooooo LONG BEACH. 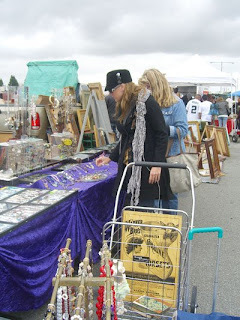 Long Beach California Flea Market. 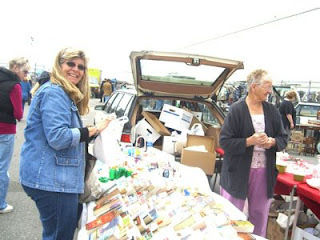 Bonnie, Jane and myself had to wake up super early and drive from San Diego to Long Beach to check out the Flea Market. It's usually the 3rd week of each month but when there are 5 Sundays in a month, they have an additional show. It seemed huge to us and we covered most of it in 5 hours but vendors told us it is soooo much bigger on the regular days. Can't even imagine!!! We brought our basket's. This is Jane and her basket. You she already has some great finds in there! Bonnie buying some great old books with blue covers or was it blue bottles or was it blue jewelry.....do you see a theme? Yes, Bonnie loves BLUE. We made two trips to the car to drop off things. 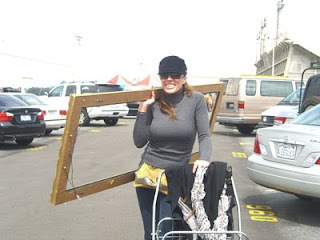 Jane got this great frame for $20! She has some jewels stuffed in her basket too! 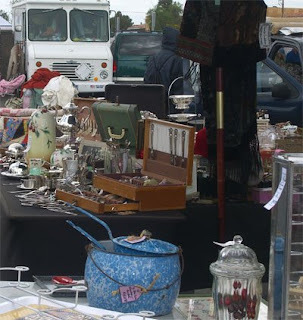 What fun to see all the antiques and fun toys. 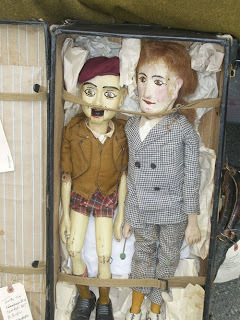 These were a pair of ventriloquist dolls waiting for the right collector or decorator. I wish I could show you all the great stuff but I was so busy shopping I forgot to take too many pictures. We packed up and took off towards San Diego but stopped in Costa Mesa for late lunch and shopping at Paris to the Moon (haven't been...you must go if you are in the LA area). This is a hat made in a cone shape and looking like a bride....beautiful. I'll close now but tomorrow I'll add another comment and some picks of an odd purchase I made at the flea market so please check back in and give me some input as to what you would do with them. ????????? It is funny but most of my friends think I am soooo organized. The "truth" if they only knew, would blow them away. I am great at organizing others but can't get it together for myself. Do you have that problem? -Babysitting my new great-nephew this friday, can't wait to hold him again! -Getting papers ready for taxes ugh! 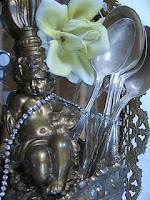 I'll post some pics of our travels to the Long Beach Flea Market next week......maybe tee hee Have a great weekend. Hi Everyone, it was a busy but fun weekend. 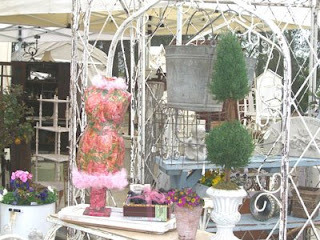 A few friends and myself found this fun place to shop 45 minutes outside of San Diego in Temecula (Wine Country). 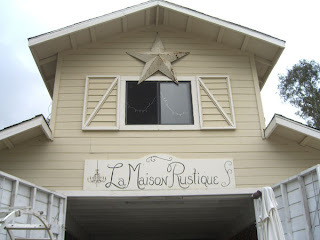 It's called La Maison Rustique or as we like to call it "The Barn Sale". 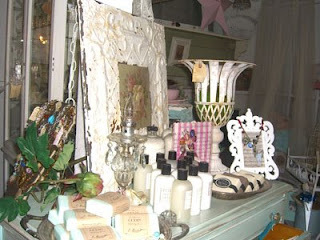 Lots of Shabby Chic, Vintage finds. The Barn Sale started in June 2007 and run by Linda Carpenter, a wonderful, generous lady. She has surrounded herself with creative, smart and fun women who made us feel so welcome. If you're anywhere near the area during their monthly sales, you need to stop by and have some fun exploring the 2 story barn with all their goodies. 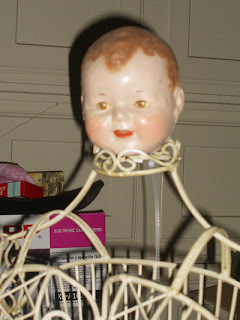 I happened on a few Kewpie Dolls in December at a holiday craft faire and wanted to make some items for a show at the La Maison Rustique Barn Sale (more on that Monday). 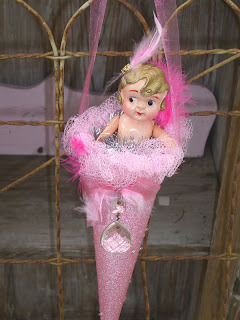 So I decided to make a Kewpie Doll in a cone for hanging. She is such a cutie don't you agree? The elastic in her little arms was spent so I glued them to her side. I placed some silver christmas tinsel around her body and glued her in this great cone I found in a little store. It has hard plastic beads on it to give it a great cover. Added a few pink feathers to her head and a little gold button as the hair decoration. 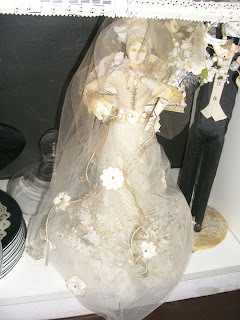 Add ribbon as a hanger and I think she turned out great.